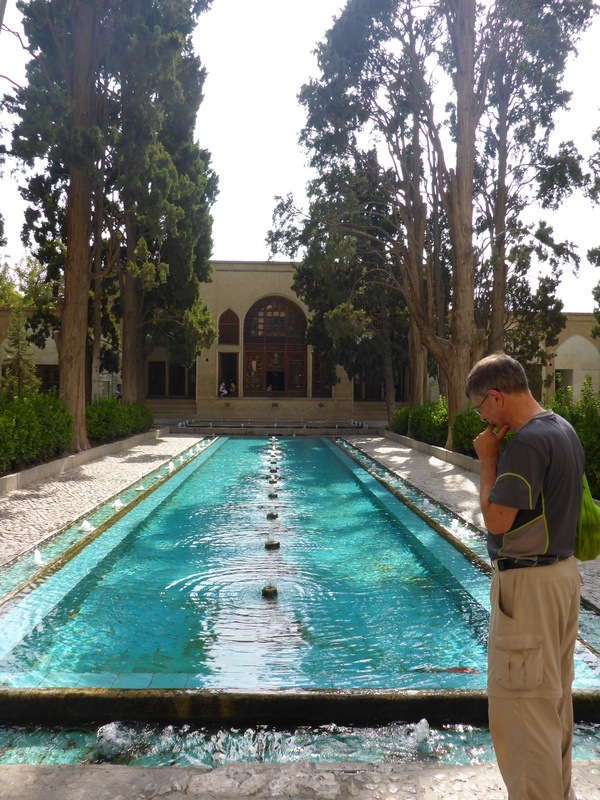 Today, Friday 5th September, we leave Tehran. The roadside butcher had finished his business – probably meat for the building crew a couple of doors down. We wave goodby and ride out onto a Friday lunchtime traffic, read Sunday lunchtime traffic as Friday is the weekend day here in Tehran. A huge change from riding as the streets seem deserted by comparison to our ride in, which is good for us as we were not looking forward to the exit from Tehran. We have to take a somewhat convoluted route to get to the main route south. A couple of U turns after we start, I hear Anne’s bike screech to a halt. She has avoided an accident with a car that was not going to stop by millimetres. 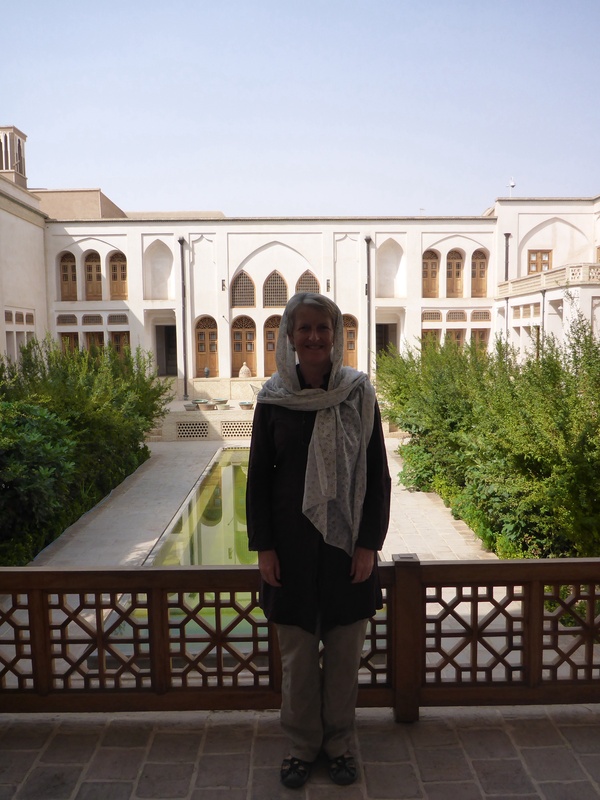 Anne has commented that she felt her body had physically aged 10 years driving and being driven in Iran. A traffic jam or two later and we are on the main road south. We approach the toll road wondering if the payment system will be less complex and easier to understand the the one that inhabits French autoroutes. Turns out that Toll road is a little bit of a misnomer for us, as it seems the large signs ban motorbikes and other undesirable forms of transport from the toll roads, we ignore the signs and the toll booths always waive us through without payment. 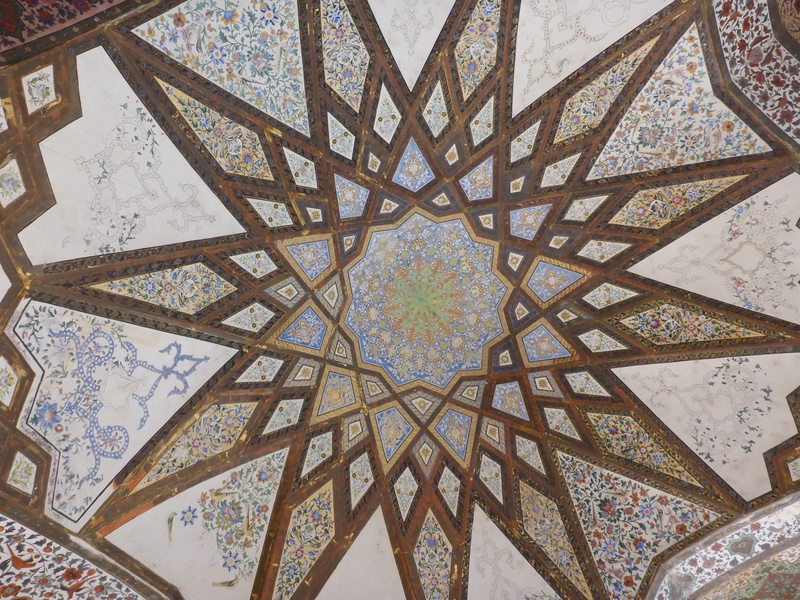 Only once in the ride from Tehran to Kashan did a policeman waive his little traffic stick with the red side visible at a toll booth, I just waived back and on we went, maybe he thought I was colour blind. Each stop for fuel, snack or our favourite lunch of canned tuna and biscuits, brought out the travelling photographers. Pictures of the bikes, us with the bikes, them with us and on the bikes, their children on the bikes. In each case they always ask, even if it is to just photograph the bikes. It sometimes takes quite a few minutes for the crowds to clear after we arrive for us to get on with whatever activity we stopped for. Still great to meet so many friendly people. 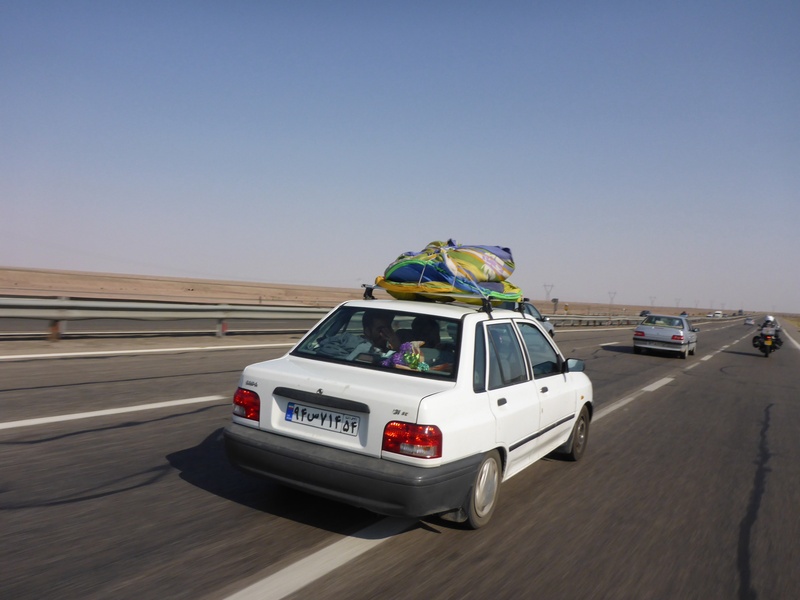 The toll is a good quality and multi lane, we make good time and arrive at the outskirts of Kashan. We hail a taxi and agree a price for him to lead us to the hotel. Usually about one US dollar. 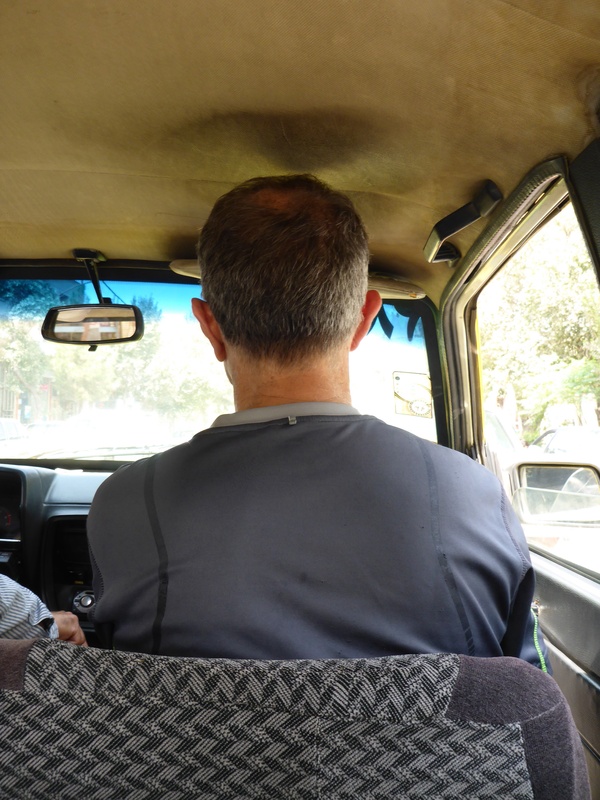 I have found that the free maps do not have the lane ways in such detail to navigate so I switch to a local and very accurate GPS system – taxis. 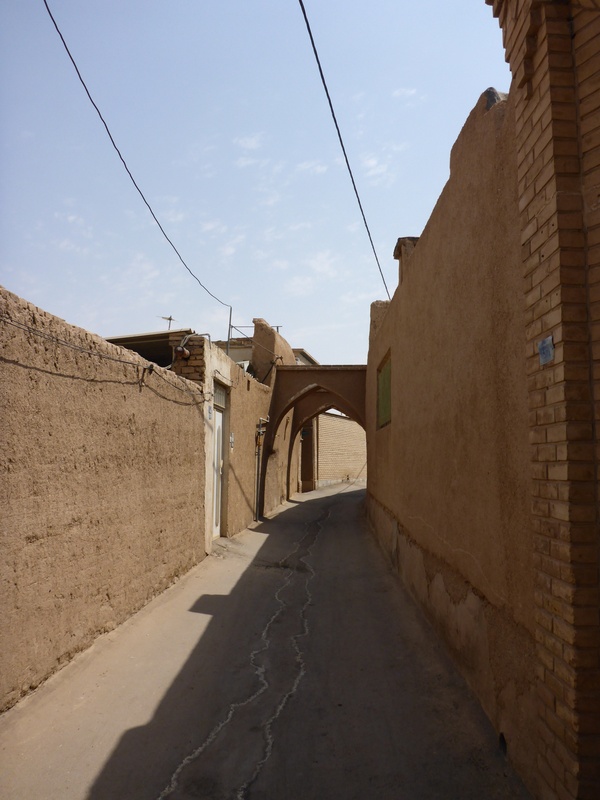 We travel down Kashan’s avenues around green and treed roundabouts, then off down alleyways, left and right to a point where the taxi can proceed no further. We ride on to find our hotel and park the bikes close by. It is beautiful inside and we are both exhausted so the air conditioning is vey welcome. Bike security is very important to us and at each hotel we look for the most secure location for the bikes. I am told go back to the white door and part there. I bring both bikes to the white door, ring the bell and am admitted. About one meter in is a set of stairs descending to a courtyard and on my left a small balcony with a couple of 125cc bikes. To get ours in will be difficult, but not impossible so I start to reposition the two small bikes: it’s great I can just lift the back and pull it around, this is the size for next trip. Just as I am getting finished, the owner of the house comes up and tells be it’s the next white gate I want! Oh apologies and I am out of there, lucky I did not get our motorbikes in. Soon the motorbikes are safely parked and I struggle back with two panniers in the 40 degree heat. It would have been nice to have some hotel help in this regard, but they all seem to have disappeared. It does seem from the number of women and children around that parts of this old building have been retained as family dwellings amid the hotel and it not clear where the boundaries are between hotel and home, especially when the children are playing outside your bedroom window at midnight. That and being near the kitchen, we decide on a room change for night number two. We get an underground cavern down eight steep steps, but the room is quiet and we are happy. It should be noted that steps in Iran never have an even step height, the builders must have to work with whatever sized materials are at hand. One really does need to “mind the step between the platform and the train” as they say. 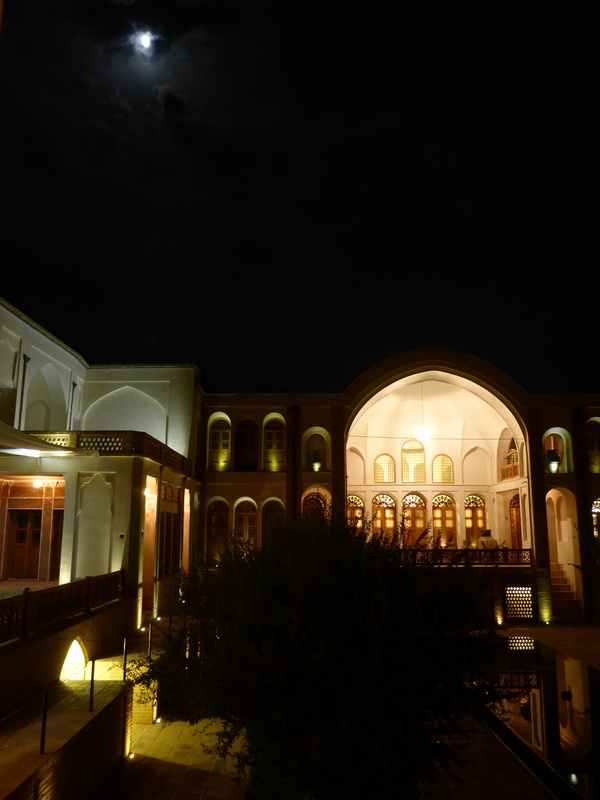 We only have one full day in Kashan and have divided the day into morning and afternoon activities, as the heat of day reaching over 40 degrees, plus everything shutting at lunchtime gives a us a window to rest and make some blog writing time in the cool of the air-conditioned room. As I have said before this makes a big difference for me, and while costing more, is preferable now to the types of places and conditions in which we stayed 35 years ago. 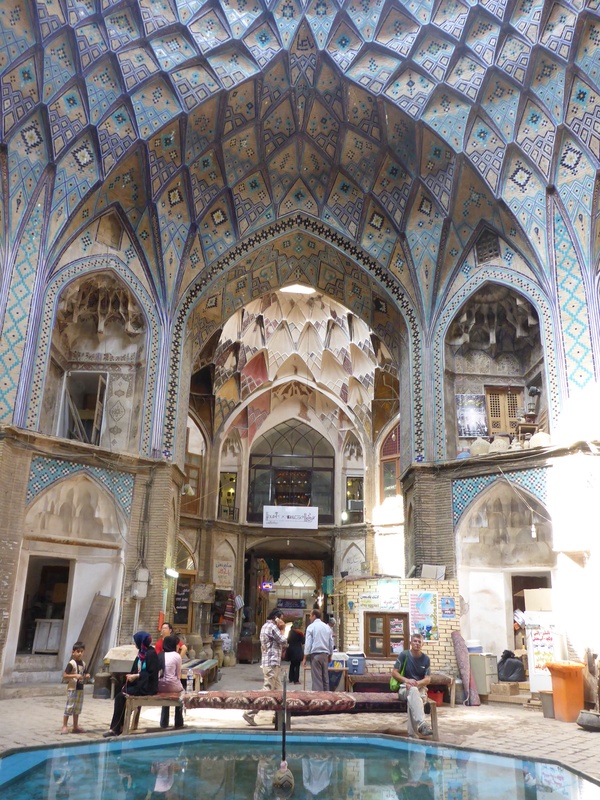 Anne had two places she wanted to visit in Kerman, one is the covered bazaar which is one of the best in Iran and has a renowned multi domed roof. 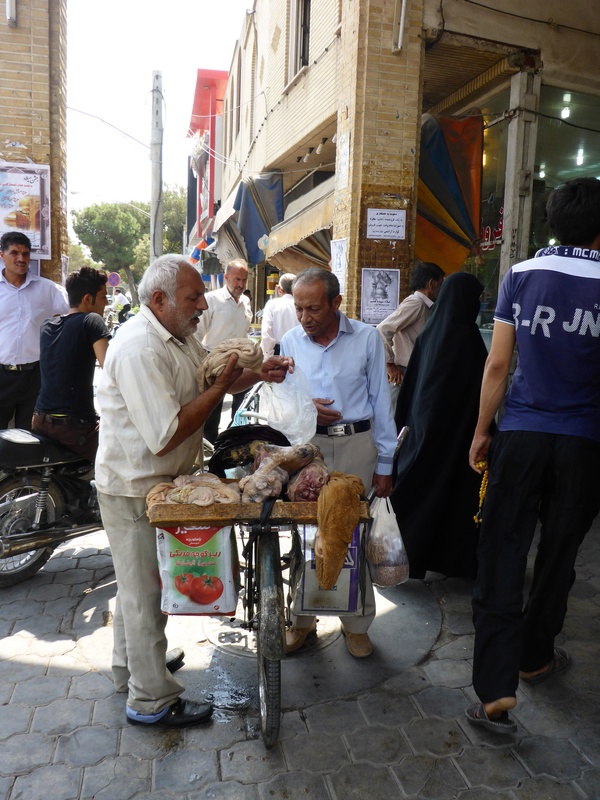 We enter from the meat and vegetable end of the bazaar and Anne immediately spots a mobile butcher on his bicycle. Meat delivered to your door: any health issues there that could preclude this at home? Past the usual stores until we spy a coffee shop down some stairs. This turns out to be a former bathhouse that has been converted into a coffee shop and restaurant. A single family has run this for generations and is still going strong. We lunch on a raised platform overlooking the fountain which for some strange reason has an oil fired flame coming out next to the water! The owner’s father and grandfather’s portraits hang on the wall. We are told the construction of the building is such that it is effectively earthquake proof. After a relaxing lunch, no hokum pipe for us, we take a photograph for the only awake German out of four sitting at the other end of the tea house. The others are stretched out on the carpet. I am sure he will have fun with that at home. 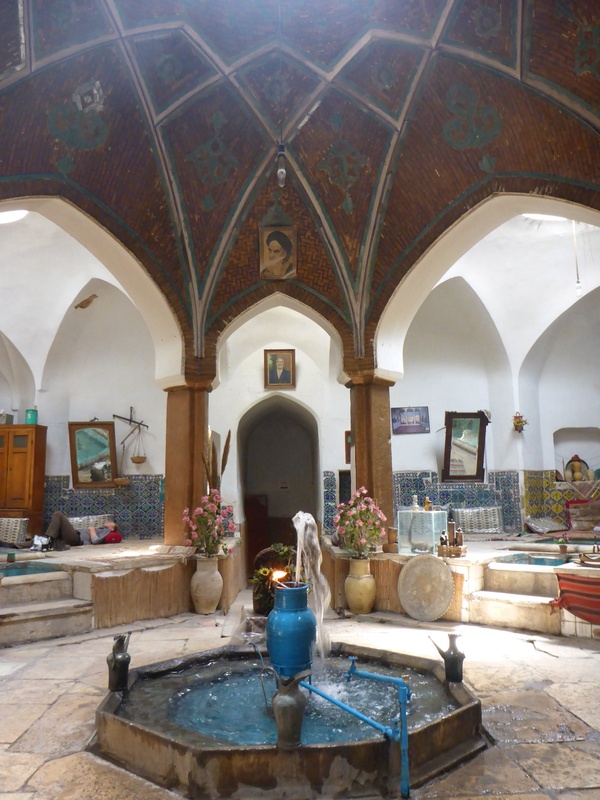 Before I wrote this section on the Bathhouse in the Kashan Bazaar, I had found people who had written similar travel reports and I thought how easy plagiarism must be today. There was a recent report on a Dutch girl who instead of travelling to Thailand for a month as family and friends thought, stayed home and used Photoshop to fake her trip as a way showing how media can be manipulated. I now realise we could have gone and done this RTW motorcycle trip while lounging on a year long round the world cruise instead. Just kidding, where do you really think we are? 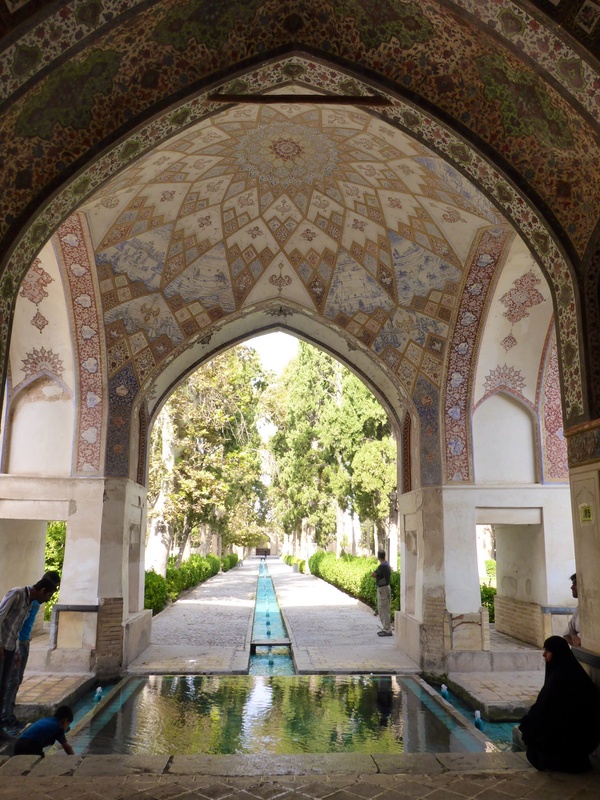 Our afternoon trip was to the Persian Gardens called Bagh-e Fin This is one of the classic Persian gardens and on Unescos heritage list. 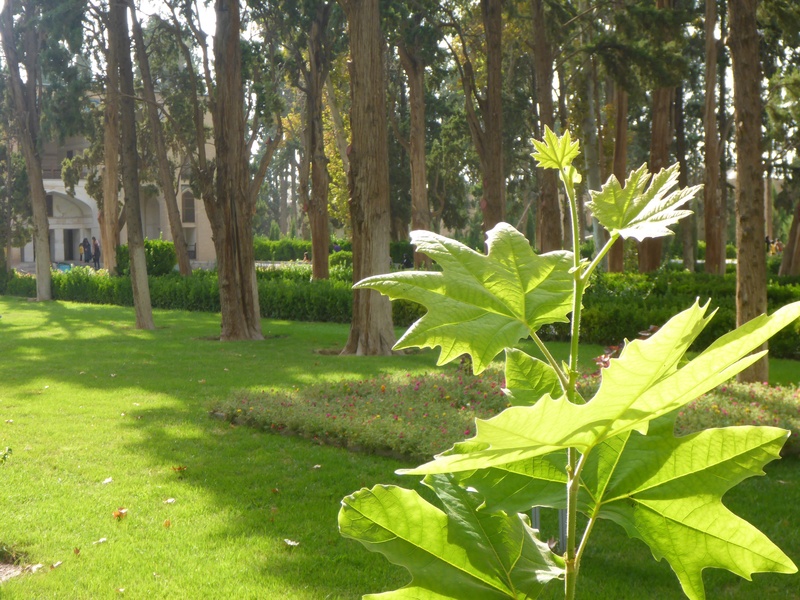 The construction and use of a gravity fed water supply to the gardens are amazing and will be reflected in the photos loaded in Dubai. They are beautifully laid out, cool with tall trees, deep green grass and the sound of running water. It is supplied with water from an underground stream that then flows towards town passing through numerous buried water storage facilities that date back hundreds if not thousands of years. Water conservation is always practiced by those in regular short supply. Good guess, but wrong, at least you are in the right hemisphere but not the right continent. Not a nightmare, all will be revealed with photos, although our guardian angel does spend a lot of time on us. I had only seen the Dutch armchair traveller a day before I wrote this, seems like the real holiday would have been more fun for her.